Known as the ‘pearl of the Dolomites’, Madonna di Campiglio is one of the most upmarket resorts in Italy, if not the Alps. The resort centres around the elegant main piazza, radiating outwards from there past the Groste cable car to Campo Carlo Magno 2 km away, where the bulk of the nursery slopes and the cross-country trails are located. While very much a resort, rather than a working town or village, Madonna di Campiglio retains a charm that many others lack, perhaps due to the fact that it was a popular summer destination for the Austrian and Central European aristocracy in the late 19th century, in particular the Hapsburgs. In fact, the Hapsburg carnival is still held today in their honour for a week in February. The spectacular backdrop of the Dolomites also helps. 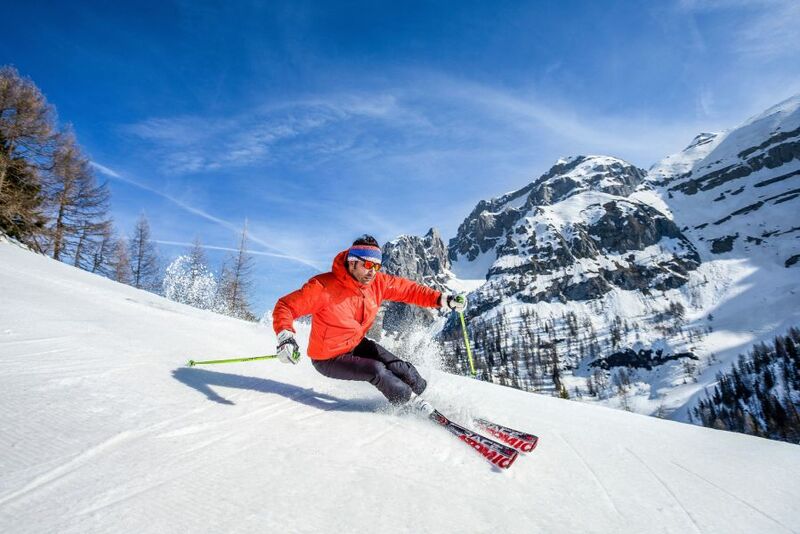 Offering an impressive 150 km of linked runs over 4 resorts the Dolomiti di Brenta ski area is the ideal size for experienced skiers, big enough to give you a variety of slopes and ski areas to choose from, but not so big that you have endless queues to get up the mountain. Beginners have the large Campo Carlo Magno nursery slopes to learn on, before graduating to the wide, easy blue runs in the main ski area. Intermediate skiers will love cruising along wide blue and red runs and improving their confidence, especially up around Groste, while more advanced skiers will enjoy getting their teeth into the challenging 3tre Canalone, Amazzonia and Spinale Direttissima black runs. Lunch options range from the chic (Chalet Fiat) to the rustic (Malga Cioca) but you will always find good food on the slopes. Most are also open for dinner in the evening, so you can get there by snowshoes or snow cat, reservation needed. Not the wildest in terms of on-piste après ski, like most Italian resorts the focus is more on going back to your accommodation, getting changed then hitting the town for an aperitivo – pre-dinner drinks and nibbles. The town comes alive in the early evening when the smart cafés and bars around the resort fill with people sipping prosecco, aperol spritz and the odd cocktail. Head to Bar Suisse in the main piazza, or Wolf, just outside the centre. The bar at Hotel Savoia Palace in the centre also offers a lively atmosphere and DJs. As you would expect from a chic resort like Madonna, there are some excellent fine dining choices, with three Michelin starred restaurants (the most of any Italian Alpine resort) and some other, more affordable options. L’Antico Focolare is a cosy pizzeria/restaurant with affordable prices. Da Alfiero is a great option for a romantic dinner with mid-range prices. Il Gallo Cedrone at the Hotel Bertelli, The Dolomieu at DV Chalet and The Stube Hermitage at the Bio Hotel Hermitage near Campo Carlo Magno have all been awarded Michelin stars. If you’re still going strong after a day on the slopes, après ski, aperitivo AND dinner, then Piano 54 and Ober 1 are the places to be seen, with live music and DJs most evenings. During high season and weekends if you want a table you better book ahead. For a more low-key, though fun, atmosphere try La Stube in the main square, which also often offers live music. Do be aware that though entry is usually free, drink prices are high – many places have a ticket system whereby you stamp your ticket for every drink and pay when you leave, so you only realise when it’s too late! The nearest airport to Madonna di Campiglio is Verona, 2 ½ hours away. Flyskishuttle.it offers a direct bus service from Verona and Milan Bergamo to Madonna di Campiglio at weekends. Book online at least a week in advance. Alternatively, there is a transfer service offered by the tourist office – it is slightly cheaper than a taxi as you might be sharing it with other guests destined for Madonna.